8’6″ diameter, the Backyard Tipi is both fun and functional. Children love it as a playhouse. Great for kids backyard sleepovers. Lightweight, packable and easy to set up. The Backyard Tipi is perfect for scout or church camps, day care centers and youth activity clubs. 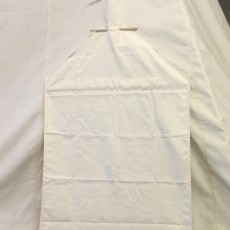 The tipi is assembled with double stitching and all areas of stress are reinforced. The door has an adjustable opening for easy entry. 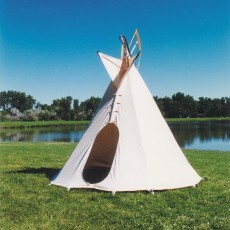 All Backyard Tipis can be painted with Latex or Acrylic Paint. This is a great way for children to make it their own. Polaris fabric is a 50% cotton/50% polyester blend. This is an excellent high quality, long lasting fabric. It is UV resistant, breathable, mildew resistant, water repellent and flame resistant, meeting the flammability standards of CPAI-84, an industry wide standard. The Polaris is flexible in extreme temperatures and is recommended for tipis that may be set up for extended periods of time. The Backyard Tipi comes complete with 10′ break-down poles for ease of packing and storage, stakes, lace pins, smoke flap sticks and a bag. We will even include some colored streamers that can be tacked to the poles for decoration. The total weight is 29lbs, ships via Fedex. 8’6″ diameter, the Backyard Tipi is both fun and functional. Children love it as a playhouse. Great for kids backyard sleepovers. Lightweight, packable, and easy to set up. 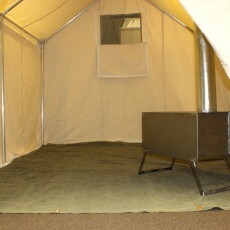 The Backyard Tipi is perfect for scout or church camps, day care centers and youth activity clubs. 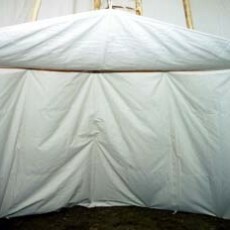 The tipi is assembled with double stitching and all areas of stress are reinforced. The door has an adjustable opening for easy entry. All Backyard Tipis can be painted with Latex or Acrylic Paint. This is a great way for children to make it their own. Our treated 10.10oz. per square yard army duck is double filled and is offered for its flame resistant qualities, meeting the flammability standards of CPAI-84, an industry wide standard. In addition to being flame resistant, it is also treated for water repellency and mildew resistance. This fabric makes an excellent choice where a durable, economic and flame resistant material is important. The Backyard Tipi comes complete with 10′ break-down poles for ease of packing and storage, stakes, lace pins, smoke flap sticks and a bag. We will even include some colored streamers that can be tacked to the poles for decoration. The total weight is 29lbs, ships via UPS.